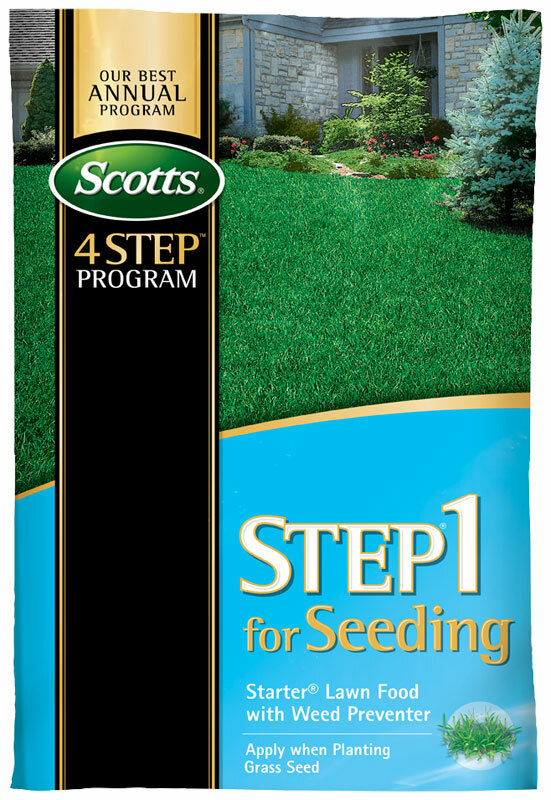 Scotts® STEP® 1 for Seeding Starter® Lawn Food with Weed Preventer not only has the strength to prevent pesky weeds, but also helps grow a newly seeded/over seeded lawn. This product will prevent the toughest lawn weeds including Large crabgrass, Smooth crabgrass, Dandelion, Common Chickweed, Ground Ivy, Yellow nutsedge, and more. Scotts® STEP® 1 for Seeding Starter® Lawn Food with Weed Preventer is for use on Kentucky Bluegrass, Tall Fescue, Perennial Ryegrass, Centipedegrass as well as fine fescues (creeping red, chewings and hard). Use on Kentucky Bluegrass, Tall Fescue, Perennial Ryegrass, Centipedgrass, as well as fine fescues (creeping red, chewing, and hard). Apply to a newly seeded, over-­seeded, or planted lawn. Do not use this products on flowers, shrubs, trees, fruit, or vegetable plants. Do not apply another pesticide within 7 days of this product as turf damage may occur. Apply this product before watering in newly-­seeded, over-­seeded, or planted lawn. For best results, apply when temperatures are consistently between 60 and 90 degrees F.
Scotts No-­‐Quibble Guarantee: If for any reason you, the consumer, are not satisfied after using this product, you entitled to get your money back. Simply send us evidence purchase and we will mail you a refund check promptly. For more details, click here. Do not allow people or pets to enter treatment areas until watering­‐in is complete and the surface area is dry. Do not apply this product in a way that will contact any person either directly or through drift. Keep people and pets out of area during application. Sweep any product that lands on a driveway, sidewalk, or street, back into the treated area of lawn to prevent run off to water bodies or drainage system. People and pets may enter the treated area after products is watered in and area is completely dry. Follow mowing instructions for seeding products. Apply this product before watering in newly seeded, over-seeded, or planted lawn. Apply this product before watering in newly seeded, overseeded, or planted lawn. Apply in a calm day and lightly water to activate. What to expect after application: prevention of listed weeds all season long, and growth of newly seeded, overseeded, or planted lawns.